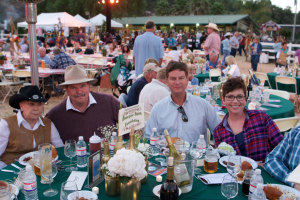 REINS’ signature community fundraiser each year, the Hoedown helps support the life-changing therapeutic horseback activities that REINS provides. A live riding demonstration by Westin Nack and Linda Searcy kicked off the Oct. 15 event. 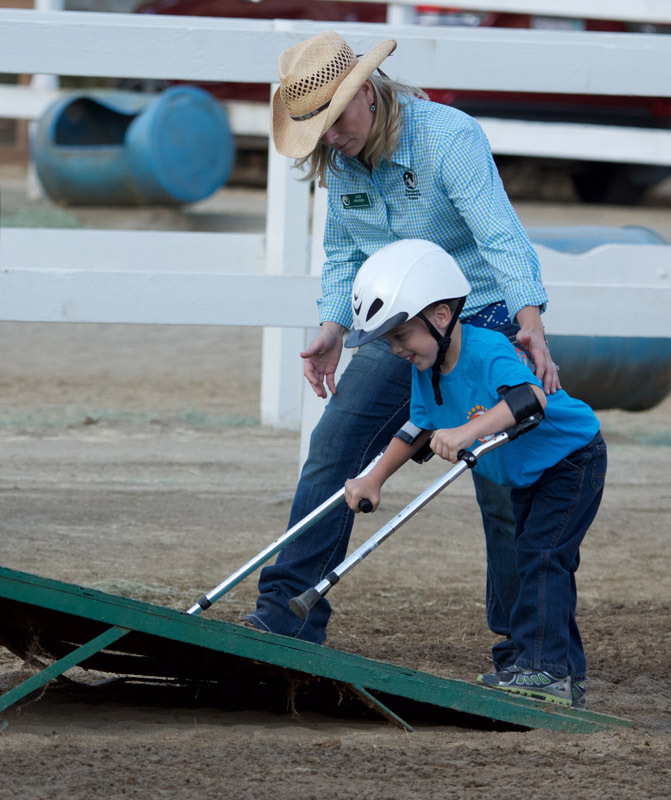 Westen Nack makes his way up a ramp with instructor Jodi Pinhero so he can get up on a horse for a demonstration ride. by local REINS supporter Bob Tavano. Attendees also watched the premier of a new video about REINS, which was produced, filmed, and donated by Fallbrook’s own David DeLauder. Just 10 minutes into the campaign the thermometer surged past the $20,000 goal set for the 20th Anniversary. Presenting Sponsor, The Donegan Burns Foundation, committed an additional $5,000 to the cause by matching all donations over $100 up to $5,000. The entire campaign was electric with young and old raising their hands and texting on their phones. Personal pledge messages were displayed on the giant screen and included notes of thanks and support. Many Fallbrook residents commented that they had never experienced anything as exciting and personal at a fundraising event. REINS staff wore blinking silver hats and interacted with the crowd personally to help fulfill pledges. At the end of the campaign, over $30,000 in pledges had been made in only 15 minutes. Shortly before dinner, Kris Henderson, accompanied on horseback by Karrie and Amie Almendarez, belted out the national anthem in honor of the 20th anniversary. Kris, Karrie and Amie have all received therapeutic horseback riding lessons at REINS for more than 20 years. The Clay Colton Band provided live music entertainment while guests enjoyed a BBQ dinner buffet catered by Firehouse Que and Brew of Fallbrook. The Fallbrook Brewing Company hosted a beer tasting in the barn area, and Stone Brewery and Fallbrook Winery handled the Saloon. This year, the Hoedown also featured a carnival area that was operated by REINS volunteers and NCL members. The silent auction overflowed with amazing baskets, art, memorabilia and vacations. All proceeds from the Hoedown go directly to support REINS. The program currently provides more than 8,000 therapy sessions to children and adults with disabilities each year. This exceptional form of therapy brings improved health, recreation and joy to the lives of the riders and their families. REINS officials termed the event “a smashing success” and thanked all the sponsors and donors for their support. They also asked people to save the date for 21st anniversary edition of the Country Hoedown, which will be held Oct. 14, 2017. To learn more about REINS, visit reinsprogram.org. REINS National Anthem singer, riders, and instructors at the hoedown are, from left, Lisa Almendarez, Grace Dickinson, Kris Henderson, Jodi Pinhero, Amie Almendarez, Alyssa O’Kelley, Karrie Almendarez, Nikki Harmer, and Jessica Swenson. Sitting at the Donegan Burns Foundation sponsor table are, from left, Bettye Burns, Dan Woodard, Andy Woodard, and Shiloh Woodard. Thanks to Pat Sohmer with Park County Public Library, during the course of the 2015-2016 school year, I was fortunate enough to have my entire class of second grade students participate in Scientific Learning’s Fast ForWord program five days a week, 20 minutes a session. In addition, my students were also able to utilize the Reading Assistant program. Throughout my 21 years as an elementary classroom teacher, I always look for ways to challenge and support my students during independent reading time. Using Fast ForWord helped to create and maintain an atmosphere of reader’s who were focused and working toward a set of goals. 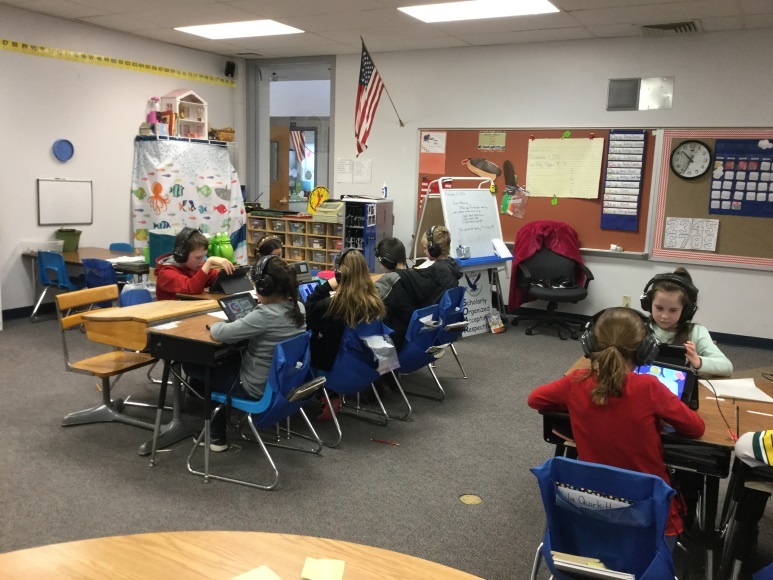 Each student was working on brain exercises specifically matched to his/her ability level and I was confident that my students were participating in a motivating, beneficial, educational program to help them increase and strengthen their reading skills. As the year progressed, the students were excited to analyze their data from the individual progress graphs. The data reinforced to students the exercises students enjoyed and did well with, as they saw their scores shoot up, but even more importantly, it helped them to see where their challenge areas were located thus motivating them to try harder and move forward. As the students saw their progress, their enthusiasm and excitement about doing their daily Fast ForWord was remarkable and contagious. The Reading Assistant program was very useful as it allowed my students to hear and practice fluency in written text. Being a fluent reader is one of the strategies of a strong reader and my class was able to strengthen their oral reading skills and in turn, their comprehension. At the beginning of the program, my class was comprised of strong readers, reluctant readers, non-readers and readers with current unidentifiable challenges. 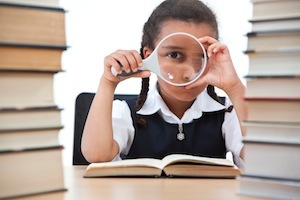 When we finished in May, at the end of the school year, my class was comprised of students who understood themselves as readers, where they were strong and where they could continue to grow. One student in particular was no longer a “mystery” to me- something within the program connected because after many months of “flat-lining”, he shot up and blasted out of the exercises in which he was working. I even noticed a difference in his overall performance as a student- I attribute this change to Fast ForWord and Reading Assistant. For all of my students, reading wasn’t just a task, but it became a way of life. Without using the program, I don’t think there would have been this type of transformation with 100% of my students. Generous support from Donegan Burns Foundation made possible the 2016 expansion of our Fast ForWord implementation that Park County Public Library began with a mini-pilot in May of 2015. At that time we had a limited 20 licenses and a continual waiting list of children and adults who registered to participate in the life-changing exercises of Scientific Learning’s Fast ForWord. The immediate impact on our community as a result of the Donegan Burns funding allowed all registered participants to access the Fast ForWord brain exercises without delay. A concern had been that having a waiting list might discourage participation. In most cases, formerly wait-listed registrants embraced their access to Fast ForWord. In some cases, however, it was a period of months before previously wait-listed registrants actively engaged. When they did engage in the exercises, participation itself seemed to be the reinforcement keeping them engaged and progressing. The self-reinforcing experience of participants in Fast ForWord is extremely important with the public library service delivery model since the library role is one of encouragement, support, and assistance rather than prescribed intervention. For the spring semester, an entire second grade class and an entire kindergarten class along with smaller groups and individuals swelled the ranks of participants with enthusiastic, motivated effort. Then across the summer, much to our joy, the Boys and Girls Club of the High Rockies adopted Fast ForWord through Park County Public Library for the reading component of their academic summer program. The January 2016 through mid-August results can be seen through the graphic display provided by Scientific Learning from our recent progress monitoring conference call. The significance shown from these graphics is that 28 students demonstrated a five month gain with 37 days of Fast ForWord usage. The number of students in the struggling category decreased from seven to five, and the number of students in the emerging category decreased from 15 to eight. 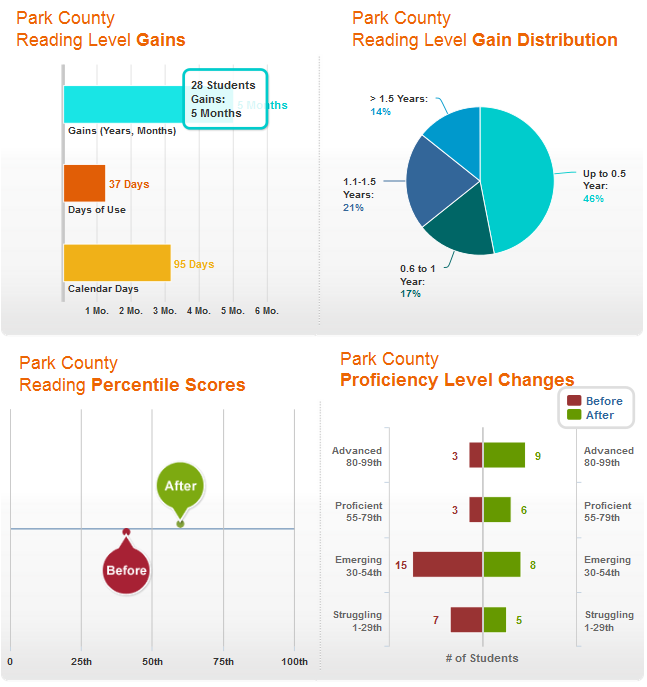 More students now appear in the top two proficiency levels. One of the unexpected challenges we faced when the summer session ended just before mid-August was that the IT department ‘wiped the I-pads clean for the fall semester’ before many of our summer participants were able to complete an end-of-summer Reading Progress Indicator assessment. The good news is that many, if not most, of our summer participants are continuing with Fast ForWord this fall through the ‘Power Hour’ program at the Boys and Girls Club of the High Rockies as facilitated by an AmeriCorps worker. Two participant categories, home school families and adults, are unaffected by the school year calendar (and, of course, school-based participants have the option of also doing their exercises at home or library). Through the end of August into the beginning of September, a family came to one of our library branches to restart the Fast ForWord exercises for their home-schooled child. To encourage the family and to coach the child, we arranged for multiple sessions where I could sit with the child and listen in using a y-adapter. In this way both the child and family built confidence in being able to continue working independent of my involvement, yet knowing I will be available for them as needed along with our trained librarian. Each of our branch managers (Fairplay, Bailey, Guffey, and Lake George) attended the January training session for Fast ForWord and Reading Assistant in order to be equipped to assist our participants. Fall semester began after mid-August and I wanted to give our teachers time to settle into their routines with their new students before I reached out to them. Surprisingly, on the first day of school two teachers from Deer Creek Elementary emailed me right away to begin planning how their students could participate in Fast ForWord. Since then two more teachers from Edith Teter Elementary have been working with me to plan their participation in Fast ForWord! Another challenge here in our rural setting is broadband capacity. Fortunately, Park County is on the leading-edge of actively participating in the initiative to improve connectivity across our 2,166 square mile expanse. One of our commissioners serves on the state Broadband Initiative as well as spearheading the Park County work to have fiber at most of our anchor institutions by 2017. As library manager, I serve on the Park County Broadband Advisory Board since our library branches are anchors institutions and community hubs. If our participants do not have adequate connectivity to do their Fast ForWord exercises at home, our schools and libraries have the capacity to serve them. One of our library branches will become a Carrier Neutral Facility in this effort. Park County’s collaborative efforts in solving broadband infrastructure problems exemplify the creative problem solving skills rural communities exhibit in addressing our challenges. Just as Fast ForWord addresses the underpinnings of literacy by improving literacy and cognitive skills, the Broadband Initiative is creating the infrastructure necessary for even more people to be able to access their online world. In addition to reaching out to our schools, home school families, and community organizations, I presented our library service delivery model for brain exercises to the international library community in June with an online session through Library 2.016. In October I will present to a 13-state conference what the Donegan Burns Foundation has made possible here in Park County and challenging my fellow librarians to replicate our efforts in their own communities. We have nearly 200 registered potential participants today. While we were not successful in obtaining Federal funding to help us acquire a perpetual site license ensuring sustainability of Fast ForWord for Park County this year, I will attend a funding roundtable (Rural Philanthropy Days) this morning to introduce myself and our need to ensure sustainability of these valuable Fast ForWord exercises for our rural community. In closing and with gratitude for the Donegan Burns Foundation funding a 1-yr (2016) site license for Fast ForWord (all funding paid the site license fee), please enjoy the letter from one of the Deer Creek Elementary teachers, the photo of some of her students engaged in Fast ForWord, and the photo of one of our home-schooled children working at the library. Donegan Burns Foundation supports Carlsbad Boys and Girls Clubs at their annual fundraiser, the Masquerade Gala September 24, 2016. Contribution pledges far exceeded the five thousand dollars matching funds which was given by DBF. From left, Board member and Secretary, Jennifer Woodard, Board member, Liz Vasek-Kane, Legal Counsel, Dan Woodard and Brian Astredo Director of Development, North County Boys and Girls Club. In addition to their on going financial support, DBF matched donations up to 5,000.00. The matching funds proved to be a great success as the donations exceeded the five thousand dollars! 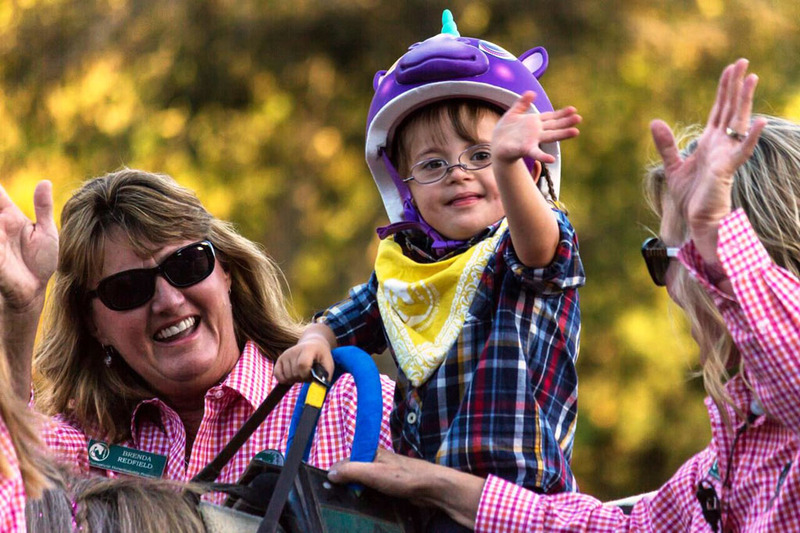 FALLBROOK – REINS Therapeutic Horsemanship Program is excited to announce its upcoming 20th annual Country Hoedown presented by The Donegan Burns Foundation. It will be held Oct. 15 from 4 to 10 pm. This ‘old time’ event is a major fundraiser that helps support the life changing therapeutic horseback programs REINS gives to disabled children and adults. The REINS Country Hoedown draws more than 800 guests from the local community and across the nation. The evening includes a delicious BBQ dinner catered by Firehouse Que and Brew, live entertainment by The Clay Colton Band, a silent auction, and riding demonstrations by REINS’ very own riders. New to the event this year is a carnival and game area for children and guests. All proceeds from this event go directly to support REINS, which is located at 4461 South Mission Rd. 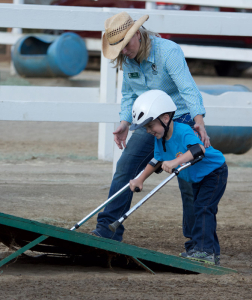 REINS Therapeutic Horsemanship Program currently provides more than 8,000 therapy sessions to children and adults with disabilities each year. This exceptional form of therapy that REINS provides brings improved health, recreation and joy to the lives of the riders and their families. Ticket prices are: adults $55 pre-sale, $65 at door; kids (12 and under) $25; military and seniors (62 and up) $45; and family pack (includes 2 adult and 2 kid tickets): $125. Sponsorships are also still available and include reserved table, hosted beer and wine and publicity. Contact Kim Shinner at (760) 731-9168 or kim@reinsprogram.org for more information. A number of you have asked for a template to follow when you submit a report to Donegan Burns Foundation and when submitting a grant renewal request…here it is. Tina Morse of Wyman Elementary in Rolla Missouri has provided an excellent model. 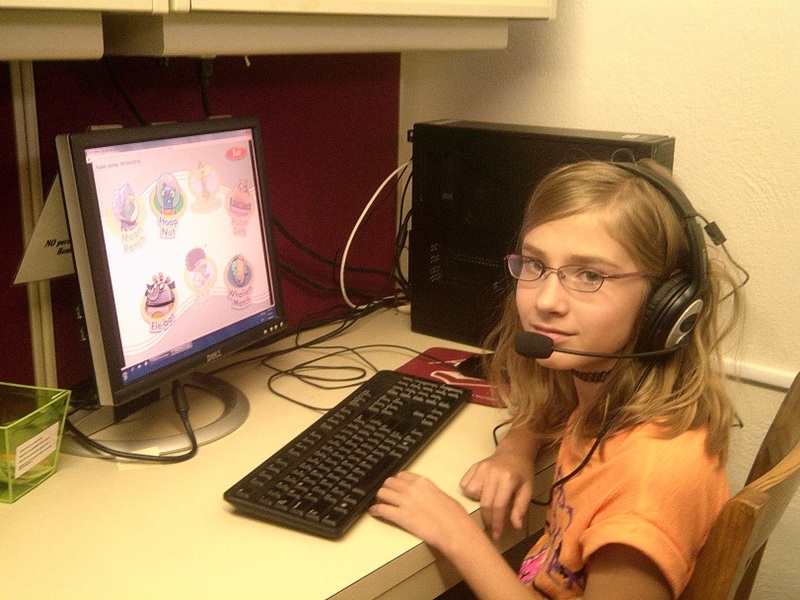 Since May of 2015 Park County Public Library, Fairplay Colorado, has been offering online brain exercises developed from the research of Dr. Merzenich. These exercises from Fast ForWord of Scientific Learning just celebrated their 20th Anniversary last Spring. In October of 2015 our Library added BrainHQ from Posit Science also developed from Dr. Merzenich’s research & was featured this Summer on The Today Show as well as in the Wall Street Journal. In January of this year, through very generous grant funding from the DONEGAN BURNS FOUNDATION for Fast ForWord and the Reading Assistant we were able to open the programs fully, accommodate our waiting list, and add the program to improve reading fluency. Around 300 participants have already benefitted from these exercises, and we’ve been able to build collaborative relationships with our schools, community organizations, and home school communities. What this means is: Libraries can truly promote literacy and intellectual freedom in substance by making access to these life-changing exercises broadly available across settings and generations! 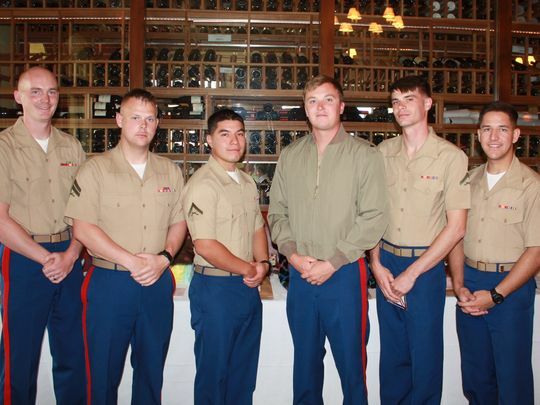 12 marines and their families from 29 Palms were hosted by the Houston Foundation. Other sponsors and underwriters were Peter Solomon, Donegan Burns Foundation, The Auen Foundation and the Classic Club. Among the guests were Lindi and Geno Biggi, Marilyn Hardie, Alice Harnell and Morris Diamond, Kelly and Heath Scarinci, Liz Vasek-Kane, Sherrie and Ron Auen and their family, Adam Devejian, Rhonda and Ray Smith, Karen Miles, Don Genhart, Michael Russell andMike Phipps. Pegasus Therapeutic Riding, under the guidance of president emeritus, Lori Sarner, began with just a couple of horses and four riders and now has more than a dozen therapy horses, 170 volunteers and 212 active clients from three school districts and many “special needs” groups. 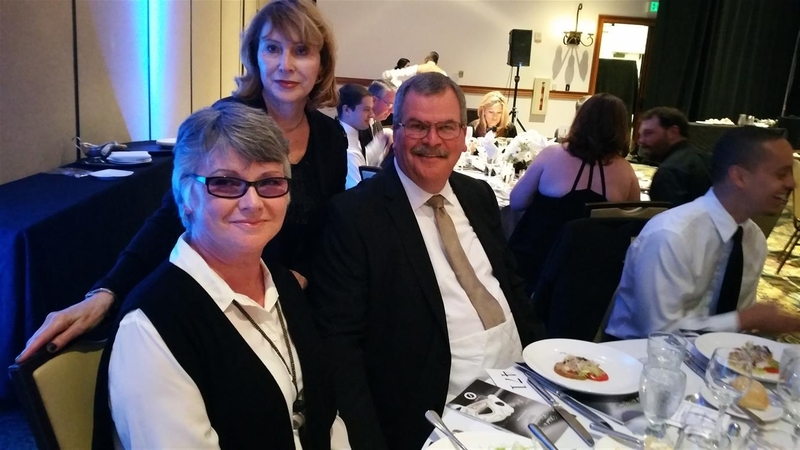 The Hearts & Horses Gala is our major fundraising event of the year and is always a fabulous night for TROT. This year was no exception, raising more than $120,000 to support our life changing programs. Results like this can only happen with the generous support of sponsors, auction donors, dedicated attendees, and a hard working group of staff and volunteers. 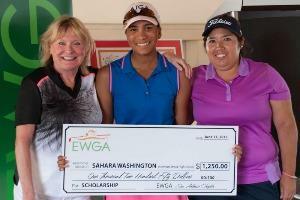 Donegan Burns Foundation Scholarship recipients for the 2015 EWGA. 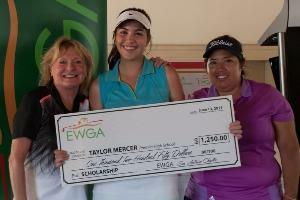 Christi Cano who appears with each of the recipients is a pro with the LPGA. Christi was a recipient of the Donegan Burns Foundation scholarship when the organization first started recognizing and giving scholarships away… She went on to become a Pro and member of the LPGA!!! Christi lives in San Antonio and is very active with EWGA. She is a super person and always reminds us of how the Donegan Burns Foundation Scholarship she received made all the difference in her life!!! 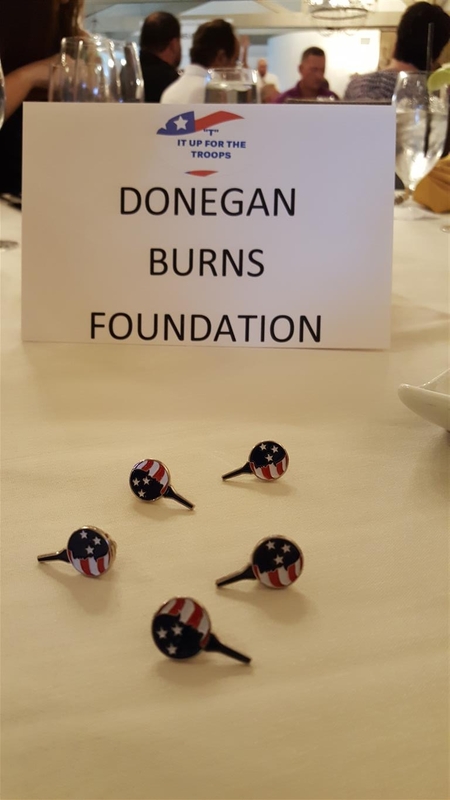 EWGA appreciates the Donegan Burns Foundation for their support! !!! 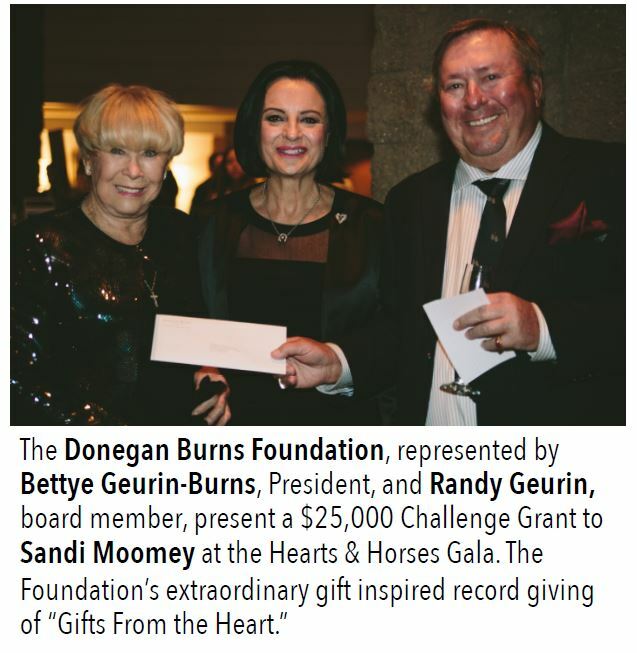 Donegan Burns Foundation changes lives!!!! 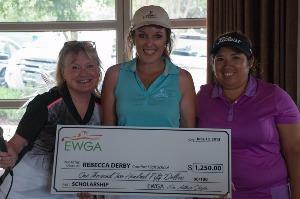 Thanks to the generous contribution, The Donegan Burns Foundation gave to the San Antonio Chapter of EWGA, the Chapter was able to give four, $1250, scholarships to four wonderful young ladies. These young girls were chosen from multiple applicants. They received these scholarships based on their community service, scholastic and athletic achievements. 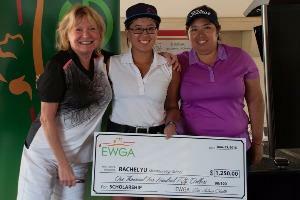 Every year the San Antonio EWGA holds a tournament to raise money and awareness for our young women golfers ages 14-18. Because of the contribution, the Donegan Burns Foundation made; in supporting and being a major sponsor, the tournament was a success and helped us to raise additional funds. 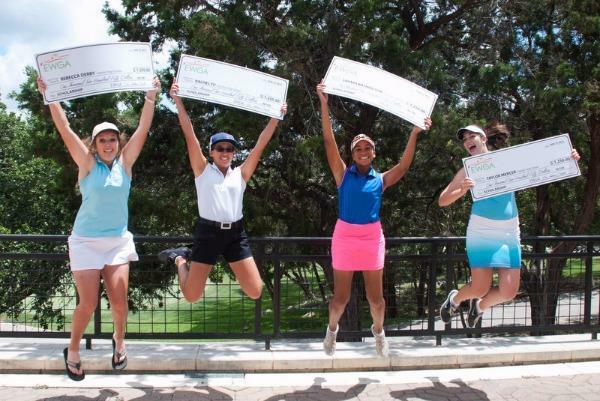 The girls use the money to enter tournaments and purchase necessary equipment for themselves to play golf and eventually be noticed by college scouts. For many of these young ladies, this is the only way they will be able to attend college. So helping them attain their goals is an incredible gift. Thank you Donegan Burns for your on-going support!